Grace Rankin Ward in 1870. Grace Rankin Ward (1844-1922) graduated from Knox College in 1865, having attended three years at the Knox College Female Seminary. While at Knox, Miss Ward was a member of L.M.I., Ladies Mutual Improvement, a secret organization for women’s empowerment, and was a Presbyterian of strong conviction. 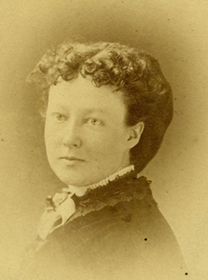 Of her time spent at Knox, Miss Ward wrote that one should, "warn the young against reading infidel books," since "one cannot touch pitch and be undefiled." As so many women did in the 19th century, Miss Ward left college to serve overseas as a missionary and teacher to women and children. She taught school and worked in zenanas (parts of houses reserved for females only) in India from 1870 to 1898 under the auspices of the Woman’s Union Missionary Society. Some of the photographs in the collection depict the missionary schools in Calcutta (now Kolkata) and Cawnpore (now Kanpur). Miss Ward reflected on life in India and on her work in spreading the Gospel in the Society’s journal, Missionary Link, saying in 1876, "... I feel that labor in schools is as important as the pure zenana work, and is a part of it, for the zenana work opens the way to the hearts and homes, and so allows us to gather in the children." Grace Ward, seated in the center, is surrounded by women and girls from a school in Inida. 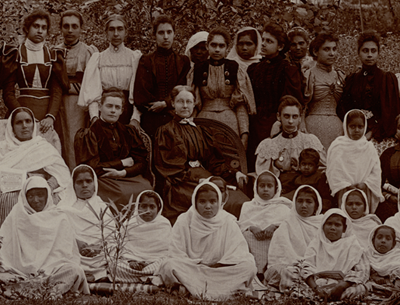 From among the 133 photographs that Miss Ward brought back from India there are some of the mission schools at which she either taught or visited. Other images reflect the exotic nature of life in India, like those images of ghats on the Ganges and several of people in traditional Indian dress. Many more photographs in the collection are images of Indian monumental architecture, such as the Taj Mahal, Kaiser Pasand and the Ellora Caves. A fair number of the photographs are of well-traveled (but no longer in existence) 19th century tourist spots reflecting British occupation, such as the Lawrence monument, the Memorial Well in Cawnpore and views of British settlements at Nainital. The photographs in this collection lead us to believe that Miss Ward also participated in the Western tourist circuit in Asia during her time abroad. The photographs—souvenirs of a sort—of portraits, buildings, landscapes, and tourist attractions provide direct historical evidence of South and East Asia in the late 19th century. The collection can be viewed as an artifact of Orientalism and the East meets West framework which continues to be so pervasive in historical interpretation. The 66 photographs of Meiji Japan (1868-1912) portray Japanese tourist attractions in a period when Japan had begun to open up to Western influence and market expansion. Most of the images come from Western trade settlements (Yokohama and Kobe), and Japanese cities of historical importance (Nikko and Tokyo), or are portraits of Japanese people in traditional dress. Many of the photographs of Japan are a part of an intertextual tradition of 19th century photographers copying poses and locations. A small number of photographs are views of Hong Kong, Singapore and Canton. The photographs from Egypt contain views of the pyramids at Giza, Port Said and the Suez Canal. Credits: The photographs in this collection came to the Knox College Archives with little or no descriptive text. Luke Madson (Knox College class of 2014) provided valuable research assistance for the project by identifying places, structures and buildings in the photographs using primary and secondary source material. Luke also wrote descriptions and provided context for many of the photographs, and he contributed text for this introduction. Assistant Professor of Asian Studies at Knox College, Weihong Du, generously provided translations and context for some of the photographs from China.